Salted Egg, Century Egg and Pork Congee or ‘Hum Tan Pei Tan Sau Yok Chok’ is a must-order dish in any Chinese restaurants (especially Cantonese restaurants) serving Tim Sum. 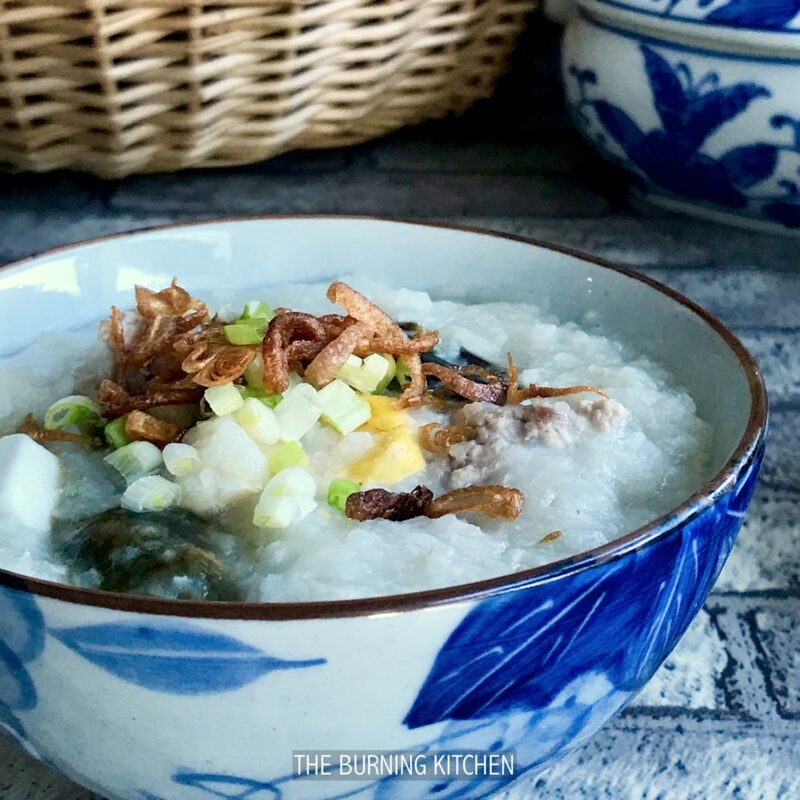 Due to the saltiness in the salted egg and salted meat, this tasty congee boasts the health benefit of reducing ‘heatiness’ in the body. Congee or porridge is also one of the most easily digestible foods, making it suitable for the very young, elderly and all ages in between. It also helps to stabilise stomach discomfort, hence its popularity as a ‘sick’ food that many turn to when they are not feeling too well. For me personally, its has always been a comfort food and a dish we must definitely have with any proper Tim Sum meal! Salted Egg, Century Egg and Pork Congee is a must-order dish for us whenever we go out for Cantonese Tim Sum! Wash the lean meat and pat dry. Add 1 tsp of salt to marinate the meat for 6 hrs or leave in the fridge overnight. Wash the rice, drain dry and transfer to a stainless pot or bowl. Add 1/2 tsp salt and 2 tsp oil to the rice. Freeze the drained rice for 1/2 hour or more while you prepare other ingredients. Remove the mud and husk from the salted eggs and century eggs. Then set aside. Wash the spring onion and parsley and cut into small pieces. Wash the Chinese ham in hot water. Slice thinly and set aside. Take out the marinated meat from the fridge and wash a few times to remove the salt. Add 2 litres of water to a big pot and bring to a boil over high heat. Add the marinated meat into the pot and boil over medium low heat for about 35-40 mins until the pork is soft. Use the chopsick to test if the meat is soft. When done, transter the pork to a plate. When the meat is cooled. shred it and set aside for later use.. Turn the heat to high. When the water is boiling, take out the rice from the freezer pour into the pot immediately and give the rice a stir to loosen it. Once the rice mixture is boiling, turn the heat to medium low, stirring it constantly until the rice grains break up (about 30-35 mins). Meanwhile, place the salted egg into a separate small pot and water to about 1" height above the egg. Turn the heat to medium and boil the egg for about 15 mins with the cover tilted. Remove salted egg and let it cool. Use a knife to cut through the egg shell lengthwise into two clean halves, then use a metal spoon to scoop out the egg from the shell. Cut the cooked salted egg into cubes and set aside. Similarly cut the century egg into cubes as well and set aside. When the porridge is ready, remove it from heat. Add 1 tsp of sesame oil and light soya sauce to taste. Divide out the century egg, duck egg and shredded meat and place into the individual bowls. Then scoop the porridge into the bowls and give it a stir. Garnish the bowls of porridge with spring onion, parsley and fried shallot and a dash of pepper, and serve hot. Freezing the rice for 30 minutes prior to boiling it is the secret to greatly speeding up the process to break down the rice grains into smooth consistency that Cantonese-style porridge is famous for. Adding salt to the rice mixture prior to freezing also helps to break up the grain. Add oil to the rice grains helps to make the porridge smooth after cooking. Unlike hard-boiled egg, hard-boiled salted duck eggs have a more hardy shell and it is difficult to remove the shell by cracking it. The easier way is to use the sharp edge of the knife to neatly crack the egg open into two clean halves, and then scooping out the egg with a large metal serving spoon. Hot water is needed for washing Chinese Ham to soften and remove the layer of hardened oil that forms around the ham. When the water in the porride is about to dry up, the porridge gets burnt easily. So watch carefully the last few minutes of the cooking time. Add some water if necessary. If the porridge looks diluted after cooking, don't worry, it will dry up a little after a few minutes with the lid covering it. Baby/Toddler-Friendly: This is a great recipe for weaning babies. But go easy on (or leave out) the salt and skip the century egg and salted egg for now. Child-Friendly: Kids may prefer to skip the century egg and salted egg, unless they have already acquired a taste for it. Egg-Free: Skip the century egg and salted egg. 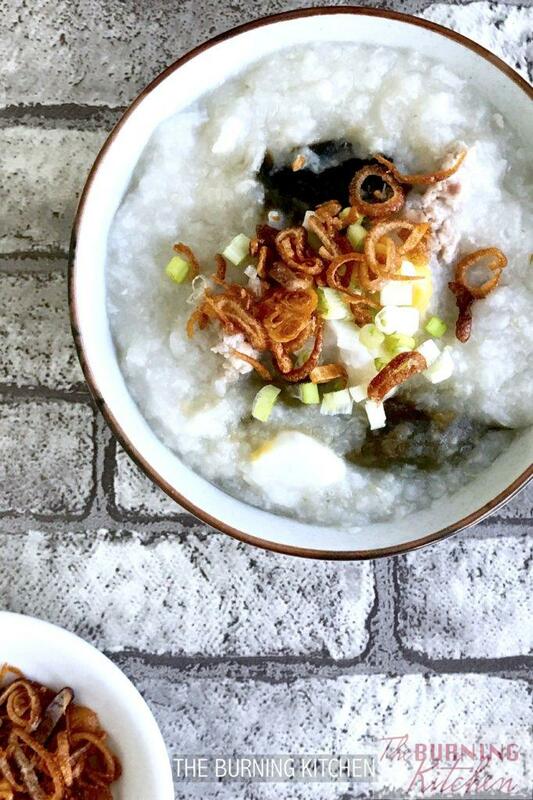 Have you tried this Century Egg, Salted Egg and Pork Congee recipe? If so, leave us a comment below to review this recipe! Or review us on Facebook! hi, may I know when to add the Chinese ham to the pot? also, can i replace the Chinese ham with waxed duck? thank you. Ham is added to the rice and cook together. Waxed duck can be used but first need to remove the skin otherwise it would be too oily. Secondly blanch the duck with hot water to remove the oil. Lastly soak the duck in the rice water ( after washing the rice, save the water for the soaking ) for about 30 mins. Don’t forget to post a picture of your final product in our FB page.